Behold the mixologist, that wizard working his magic behind a magnificent bar reclaimed from a defunct Omaha saloon. He knows his Peychaud’s bitters from his Angostura, will make you an aviation or a stinger without a flinch or a peek at his iPhone, can discourse at length on the favorite daiquiri of Ernest Hemingway (“without sugar and double rum,” in Papa’s own words). He is a sophisticate who will relieve you of your sobriety and your cash. And he will do it with the solemnity of a parson at a funeral. I envy the modern mixologist, but I don’t necessarily want to be in his somber presence every time I crave a cocktail. Yes, a proper martini might just be the thing to rescue a moribund Tuesday night; but in major cities like New York and San Francisco, the kinds of places where excellent cocktails are mixed are increasingly the kinds of places where I don’t actually want to drink: exclusive, expensive, more sanctimonious than the Vatican. Nor am I capable of imitating the mixologist at home. I don’t know my bitters. I don’t know my vermouths. I never know whether to shake or stir and so end up simply pouring everything together in an inchoate alcoholic slop. I might as well just pop open a Pabst. Or maybe not. To my rescue comes an unlikely savior, sealed in a bottle. Yes, the combination of American lassitude and American ingenuity has resulted in yet another civilizational advance: the premixed cocktail. You, the imbiber, are required to bring nothing to the table other than glassware, some ice and your own intrepid liver. Premixed cocktails have a sordid and florid past. You can probably find premixed margaritas in some woebegone corner of your supermarket. They are colored like radioactive sludge and loaded with enough sugar to give an elephant jitters. There is no reason a human being should drink them. Likely, no human being ever has, outside of a tiki-themed frat party at Palookaville State. 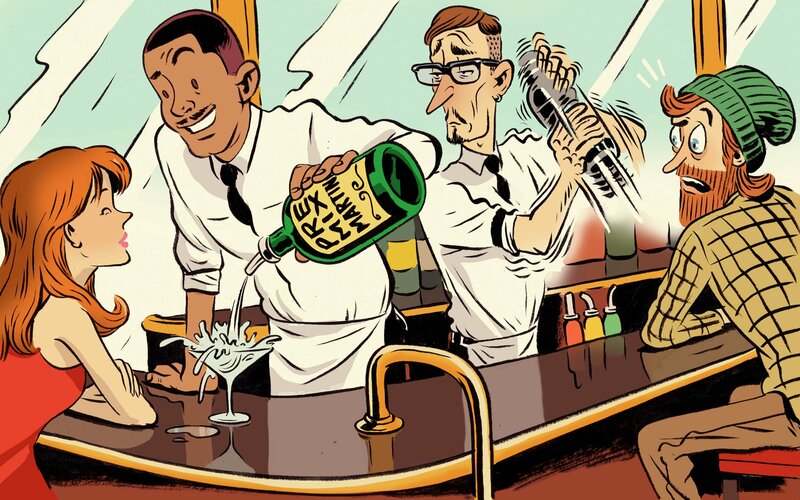 But the recent interest in all things small-batch and locally sourced has led mixologists to reconsider premixed cocktails, with even the high priests of The New York Times food section lavishing praise on the nascent trend. Don’t laugh. After all, if boxed wine can be made cool, then why not a manhattan in a bottle? One had to taste it to believe it, so I did. Happily. Many times. For the sake of journalism but not without pleasure. With enough pleasure to declare that the premixed cocktail is becoming a veritable thing. A thing you may well enjoy, if you enjoy drinking things. The secret to a good premixed cocktail is really no secret at all: ingredients. The “barreled manhattan” from the High West Distillery in Park City, Utah, for example, is made with the distillery’s own high-end rye. After the addition of vermouth and bitters, the manhattan is aged for 90 days in a barrel. Served properly, it tastes as a manhattan should. Does it taste exactly like the manhattan I once drank at Harry’s New York Bar in Paris? Well, not exactly. But I don’t get to Paris every weekend. Equally impressive is the trio of pre-mixed cocktails from Crafthouse: the Moscow Mule, the Southside and the Paloma. In each case, mixologist Charles Joly uses real juices and pure cane sugar, avoiding the cloying chemical sweetness that usually comes with artificial additives. Light on alcohol, the Crafthouse cocktails seem perfectly tailored for lazy summer afternoons. Look, I get that watching a true mixologist at work is fun; I get that slow enjoyment is the best enjoyment of all. But I, like every true American, crave nothing like I crave convenience. Give me peanut butter and jelly in one jar, give me shampoo and conditioner in one tube, stuff pepperoni into the crust of my pizza. And while you’re at it, pass the screw-top dirty martini.